Japanese is one of the international cuisines I love most. The subtle flavors, the delicately balanced seasoning, the use of ingredients I’m not familiar with, the intricate presentations are just some of the many reasons why I’m head over heels for Japanese food. This month’s Daring Cooks challenge suited my passion to a T: we were asked to make Hiyashi Soba and Homemade Tempura. Tempura I knew very well (but never tried to make it at home before) but Hiyashi Soba? I had served soba noodles in soups before but I didn’t know it’s also served cold as a beautiful and tasty noodle salad to refresh hot summer days. Now, it’s far from being summer over here right now (there’s a snowstorm raging outside as I’m writing this), but I thought combining Tempura with the cold salad would make up a great winter meal. Because it’s so easy to do and we love it so much, I added a piping hot miso soup just to make sure we would stay warm. The Hiyashi Soba salad is quick and easy to do: I prepared everything in advance and kept my ingredients in the fridge while I concentrated on the Tempura part of the challenge. I’m not afraid of frying foods because I’m always very careful: I use a simple large cooking pot that I fill a third of the way up with canola oil, I watch the temperature of the oil carefully using a deep-fry thermometer and – most importantly – I never ever leave the kitchen while the oil’s on the stove. Prepare everything in advance. Cut up the veggies, blanch those that need to be, shell and flatten the shrimp. Put everything back into the fridge until the very last minute. The ingredients need to be very cold when you dip them into the batter and plunge them into the hot oil. The temperature shock is what makes tempura so light and crisp. 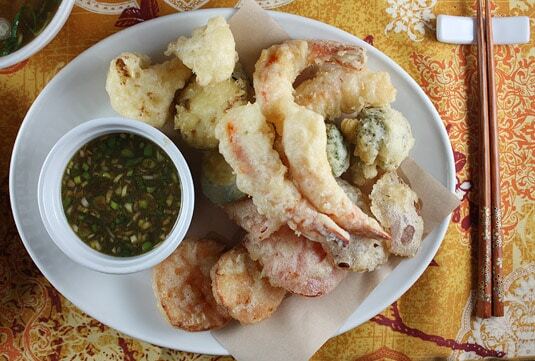 To ensure a fluffy tempura batter, use sparkling (soda) water instead of regular water. This is a tip I’ve seen in many Japanese cookbooks and it is also Michael Ruhlman’s advice in his book Ratio. The tempura batter must be mixed at the last minute and stirred as little as possible. If you’re using sparkling water, you’ll see it bubbling quite profusely. Mix just enough to break up the larger flour pockets but lumps must remain. 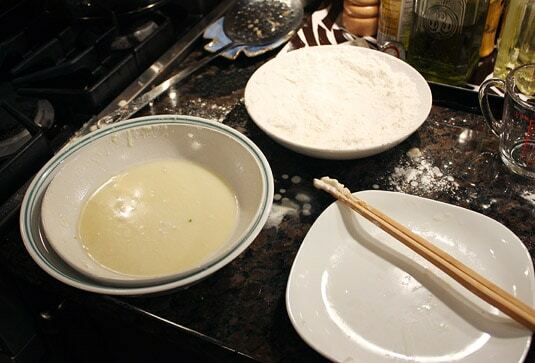 A good way to make sure you don’t stir too much is to use chopsticks to mix the batter. The batter must also be kept as cold as possible. 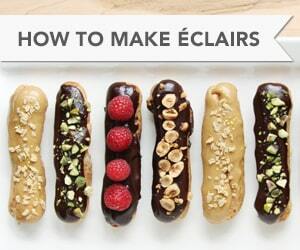 Best way to do this is to place the batter bowl into a larger one that contains ice and water. As you’re working close to the stove when making tempura, the batter can warm up very quickly and this could result in soggy tempura. The temperature of the oil must be kept between 325 and 350°F (165 and 180°C). The best way to monitor the oil temperature is by using a deep-fry thermometer. If you don’t have one, go out and buy one. I got mine at a dollar store for less than $3 and it works fine. Using a thermometer is safer and it allows for precise cooking. It’s not a single-use gadget either: you’ll be using it for candy as well. Cook the food in batches. If you overcrowd your pot, the temperature of the oil will go down and you’ll have a hard time bringing it back up with the food in. The trick is to keep the oil temperature as constant as possible. Tempura cooks very quickly and doesn’t brown up. Veggies shouldn’t take more than 3 minutes to cook, shrimp no more than about 2 minutes. Don’t wait for your batter to turn golden-brown (fried-chicken style) or your food will be severely overcooked. Well-cooked tempura is light in color and very crisp. Fry smelly foods last. Cook delicate ingredients like sweet potatoes or zucchini first and end with pungent ones like onion and shrimp so your zucchini doesn’t end up tasting (and smelling) like shrimp. Keep cooked tempura crispy and hot by storing it in a preheated oven. There’s no need to rush and cook everything at once! Preheat the oven to 250°F (120°C). Prepare a baking sheet by lining it with paper towels and a cooling rack. Setting the fried tempura on a rack will keep it crisp and it’ll keep nicely hot in the oven while you cook the rest of the food. You can also prepare the tempura in advance (or keep leftovers) by letting it cool completely on the rack, then storing it in an airtight container in the fridge. To reheat, put back on the rack, in the baking sheet (without paper towels) and heat up slowly at 325°F (165°C) for 5 to 8 minutes. Turn all pieces once to ensure they’ll evenly heat and crisp up. All in all, it was a great experience and we absolutely loved this meal. My first tempura was crisp, light and the vegetables were perfectly cooked. It’s unlikely I would have thought of making my own so I’m happy the Daring Cooks pushed me to do so! The Hiyashi Soba Salad and its dipping sauce were so fresh and tasty, it made me long for summer. For sure I will make this again and again, after all, how can you get bored with such a salad when you can come up with a different combination of vegetables and proteins every time you serve it? The Miso Soup was the icing on the cake, sipping it throughout the meal brought everything together. E and I really enjoyed this dinner and it fueled our dream to visit Japan. We’re at the planning stage to go this fall, fingers crossed! Messy kitchen, delicious meal. Homemade tempura, it’s really worth it! This soup literally takes 5 minutes to put together. Serves 2. Mix everything together in a small pot over medium-high heat. Bring to a boil and stir to dissolve the miso paste well. Serve. Based on Globetrotter Diaries and About.com – Japanese Food recipes. Heat 2 quarts of water and a generous pinch of salt to a boil in a large pot over high heat. Add the noodles, stirring gently to separate. When the water returns to a full boil, add 1 cup of cold water. Repeat this twice. When the water returns to a full boil, check the noodles for doneness. You want to cook them until they are firm-tender. Do not overcook them. Drain the noodles in a colander and rinse well under cold running water until the noodles are cool. This not only stops the cooking process, but also removes the starch from the noodles. This is an essential part of soba noodle making. Once the noodles are cool, drain them and cover them with a damp kitchen towel and set them aside allowing them to cool completely. If you’re preparing the noodles in advance, store them in an airtight container. Try to arrange them neatly in the storing container, not in a messy pile. To serve, if the noodles have stuck together a bit, put them in a colander and run very cold water through them, they will instantly loosen up. Drain very well before serving (I dry them with a clean kitchen towel to make sure there won’t be any water in my plates). Mix everything together in a screw-top container. Mix very well. To serve, divide up the noodles on each serving plate. Arrange your choice of protein/vegetables to the side. Try to do it elegantly and neatly, Japanese-style! Sprinkle the noodles with some green onions, sesame seeds and nori flakes. Serve each serving with a bowl of dipping sauce. Put additional small serving dishes of each seasoning on the table so everyone can add more to taste. The noodles are eaten by sprinkling the desired garnishes into the dipping sauce and eating the noodles by first dipping them into the sauce. Feel free to slurp! Put mirin in a small saucepan and heat gently. Add soy sauce and dashi broth in the pan and bring to a boil. Take off the heat and cool. Refrigerate until ready to use. 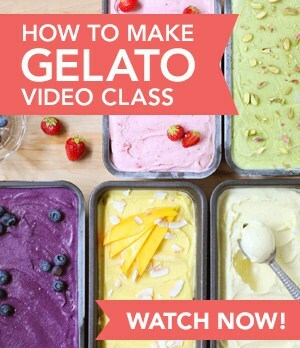 Based on recipe by Pink Bites, Itsy Bitsy Foodies, and Michael Ruhlman (Ratio). Prepare all the vegetables and the tiger shrimp. Store everything in the fridge until right before frying. 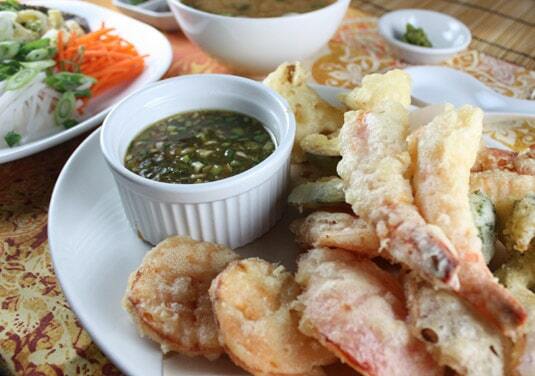 Video: How to prepare shrimp for tempura. Watch below or click here to view it in HD on YouTube. Place the iced sparkling water into a mixing bowl. Lightly beat the egg yolk and gradually pour into the iced water, stirring (preferably with chopsticks) and blending well. Add flours and baking powder all at once, stroke a few times with chopsticks until the ingredients are loosely combined. The batter should be runny and lumpy. Place the bowl of batter in an ice water bath to keep it cold while you are frying the tempura. Heat the oil in a large pan or a wok to 325°F (165°C) or up to 350°F (180°C). Monitor the oil’s temperature with a deep-frying thermometer. Start by frying the vegetable, cooking those with a delicate taste first. Dip each piece of vegetable in a shallow bowl of flour to lightly coat them and then dip them into the batter. Slide them into the hot oil, deep frying only 3 to 5 pieces (depending on the size of your pan) at a time so that the temperature of the oil does not drop below the recommended temperature. Place finished tempura pieces on a wire rack set in a baking sheet lined with paper towels so excess oil can drip off. I like to sprinkle tempura with fleur de sel – do so if you wish. 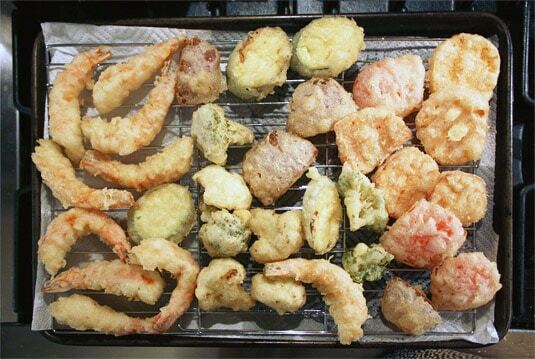 Keep the cooked tempura pieces in a 250°F (120°C) preheated oven while you cook the rest. 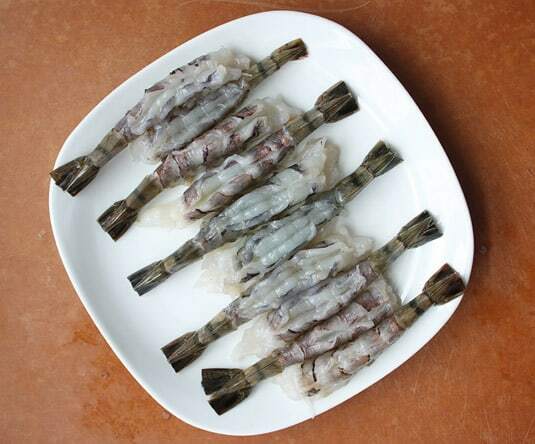 Fry the shrimp the same way, dredging in flour first, dipping into batter second. Plunge the shrimp into the oil holding it by the tail so it stays straight and doesn’t curl up. Serve with Japanese soy sauce for dipping! That really helped me with the tempura. I'm in a dinner party that prepares only new recipes. I have to transport the tempura and wanted to know about reheating it. Thanks for the vegetable hints also. To be honest, tempura is one of the worst dish to prepare in advance, it’s really a dish to enjoy right after it’s cooked. My fear is that it will turn soggy if you try to reheat it. If you really must make it in advance, your best bet is to set each piece of tempura cool completely on a rack right after you’ve fried it. Then reheat your tempura in a 375°-400°F oven – on a rack, again, set over a baking sheet. If you set the tempura directly on a baking sheet, the bottom will be soggy. Using a rack is your best bet – but I can’t garantee it’ll take as light and fluffy as if you’d just made it! Good luck, I hope it turns out well. Wow, it all looks so delicious. Will definately be trying your recipe for Miso soup soon. Yum! That’s a very beautifully done challenge. Love that you completed it with miso soup, my favorite! Excellent job! Marie, you did a wonderful job on this challenge – everything looks like it’s professionally done – gorgeous! Thanks Mardi, your comment is very flattering. I think the fact I love Japanese food so much motivated me to go all out and be very meticulous with this one! 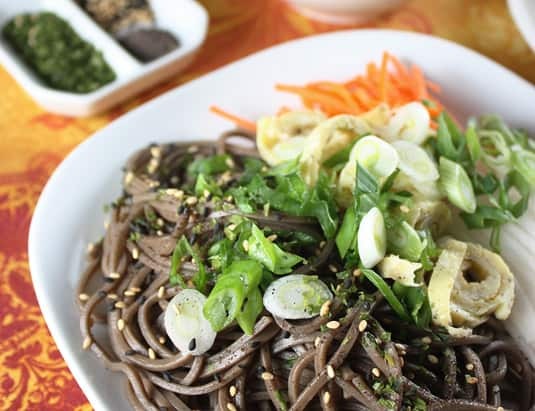 I’m happy about the results and I can’t wait to enjoy the leftover soba noodles today for lunch! Wow! I’m so impressed with the level of details you went into! 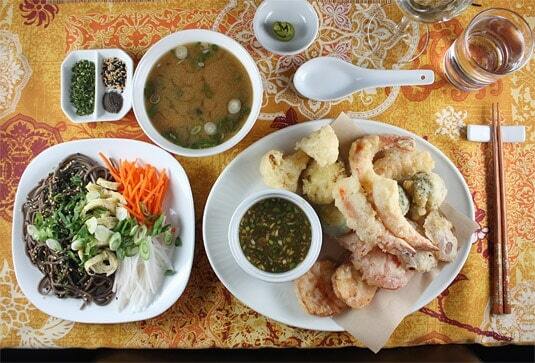 Your Japanese meal looks so delicious and everything is just perfect! Congratulations! I was also so pleased at how it turned out! I would have happily paid for such a meal at a Japanese restaurant – I had never achieved this level of satisfaction with homemade Japanese food before :) So happy to have participated in this challenge. WOW astounding photography everything is perfect you can almost smell the food you are the tempura master I think. Great work on this challenge I love the picture of the butterflied prawns. What a beautiful meal you made. The sesame on the noodles is wonderful, and the tempura looks so perfectly crispy. Amazing job on this challenge! Yes, I love sesame seeds on anything, but they were especially good on the soba salad! And the tempura turned out beautiful, I was surprised at how crispy it stayed even as it rested in the oven while I cooked all of the veggies and the shrimp! I think it’s the perfect batter.